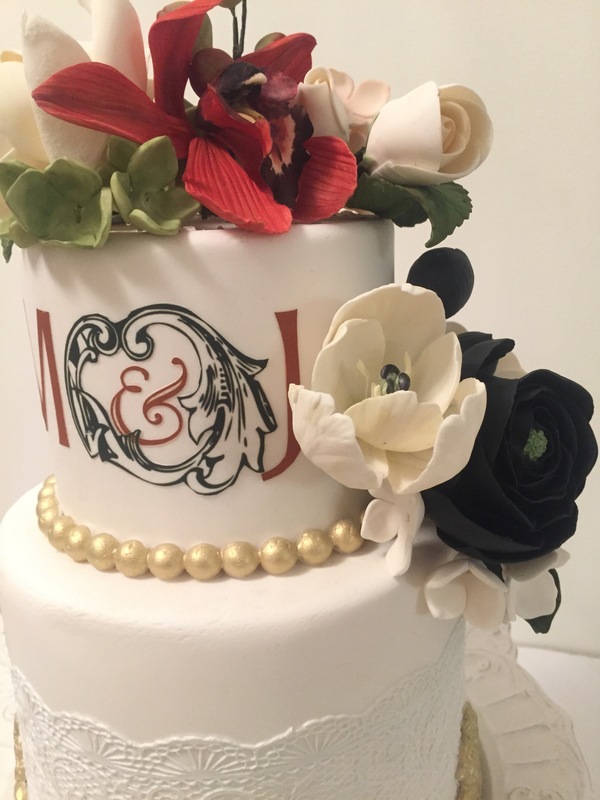 When my great friend Michelle announced her engagement I immediately went to work designing a cake for her sophisticated red, black and gold theme. 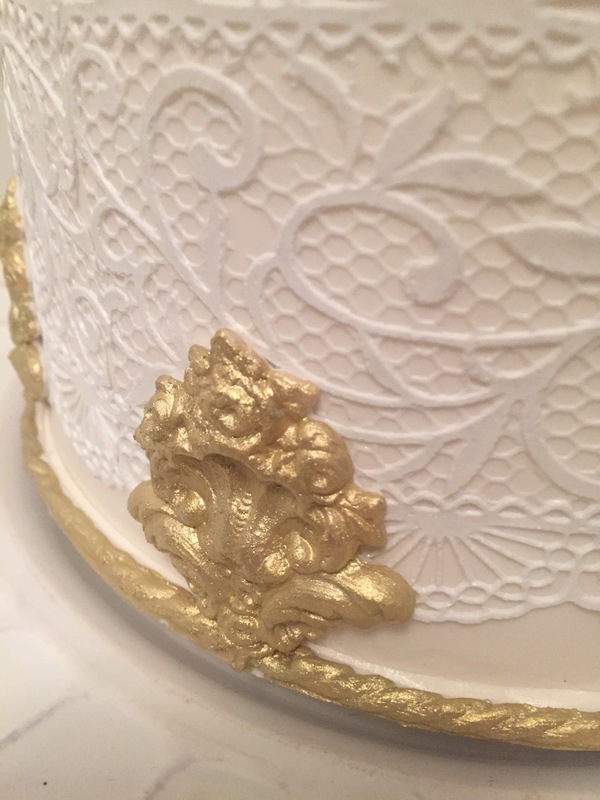 I came across photos of a cake in Ron Ben-Israel’s gallery on facebook that had a lot of lace, a lot of gold, and my favourite detail – those little ornate feet! Michelle and Jay immediately agreed that it fit their vision. I have always wanted to reproduce an RBI cake. He is, hands down, the best cake decorator on earth. 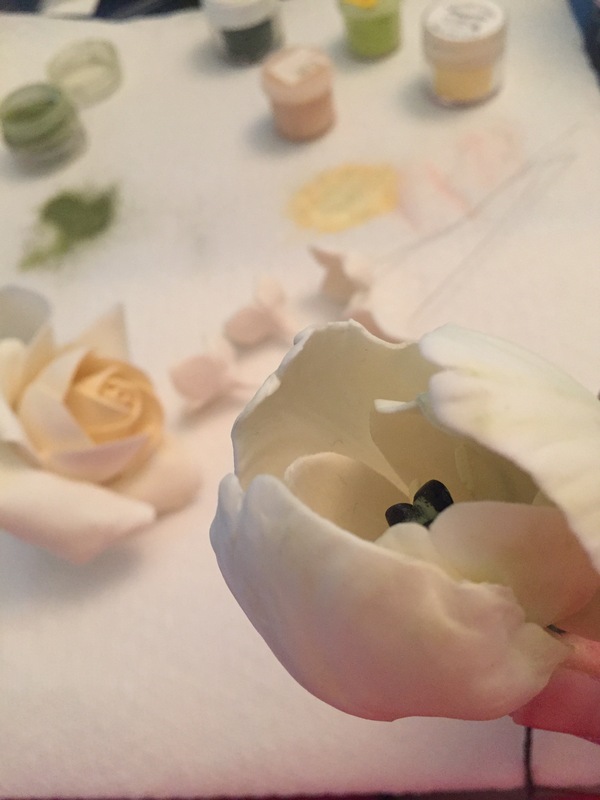 In 2010, in preparation for my own wedding cake, I had the privilege of attending a three-day sugar flower course taught by Ron. 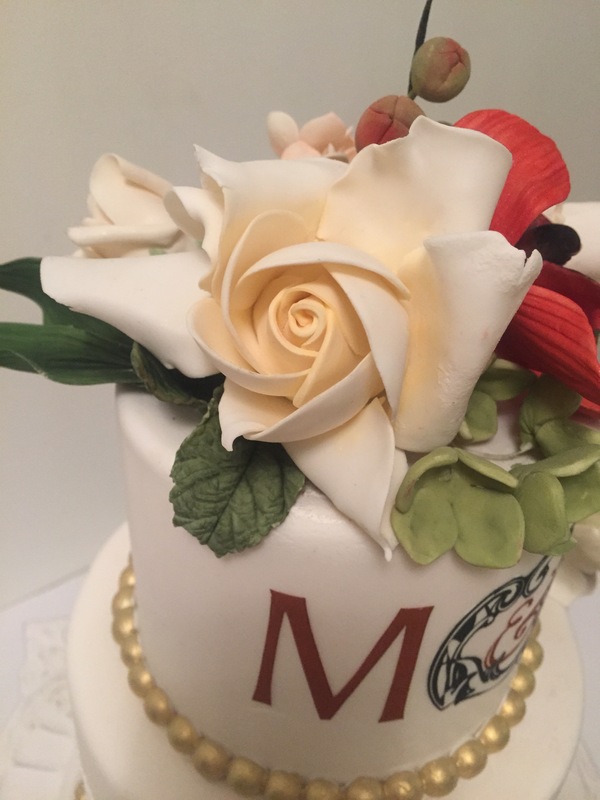 I jump at the chance to make sugar flowers for a cake. 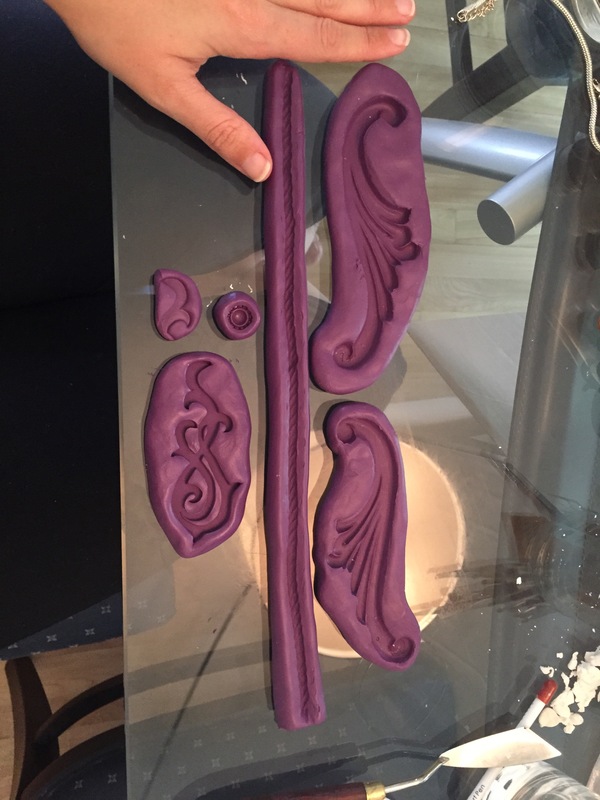 This cake required a number of silicone moulds, a few simply did not exist so I made them myself. 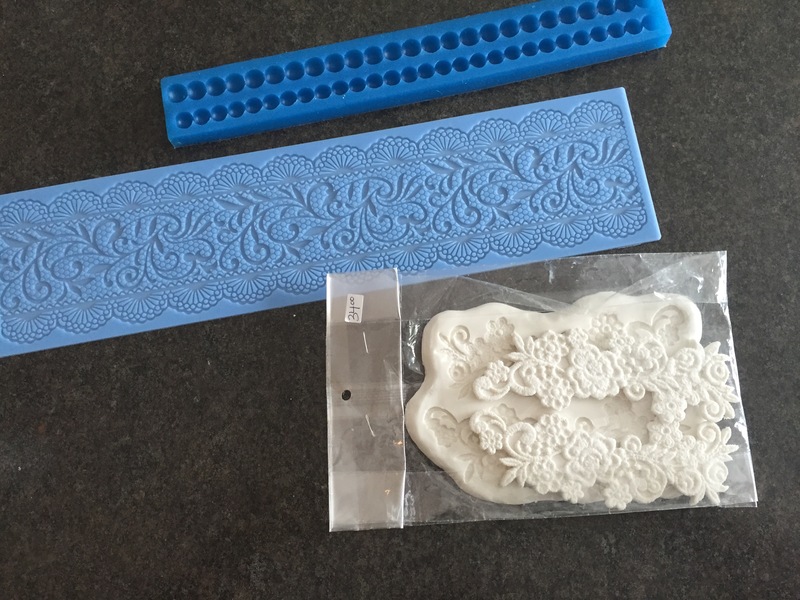 I purchased a few moulds to make lace as well. 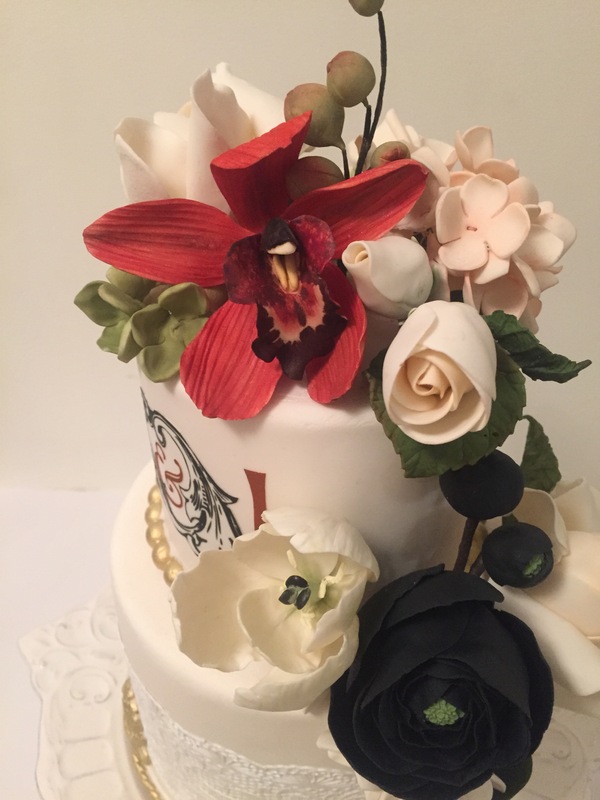 I made some roses, hydrangea, a tulip, ranunculus and a cymbidium orchid out of sugar. 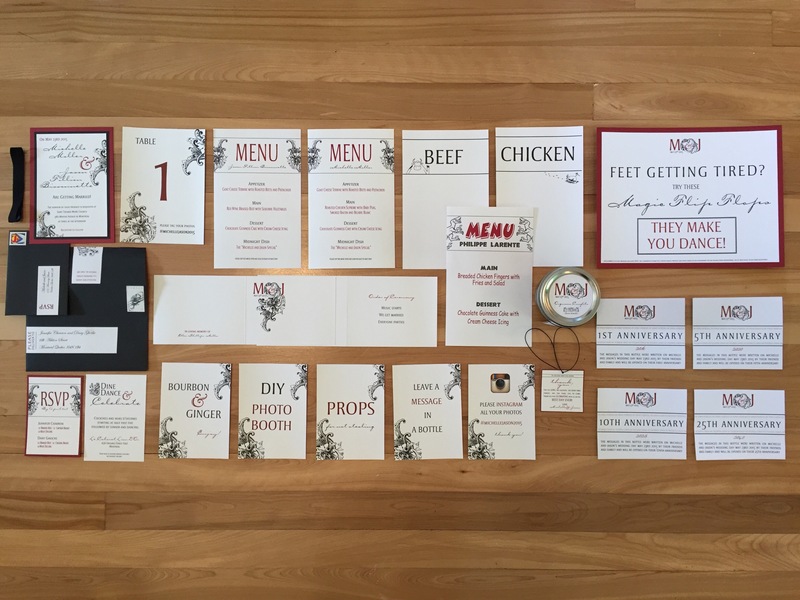 I also designed and produced all of Michelle and Jay’s stationary for the wedding. 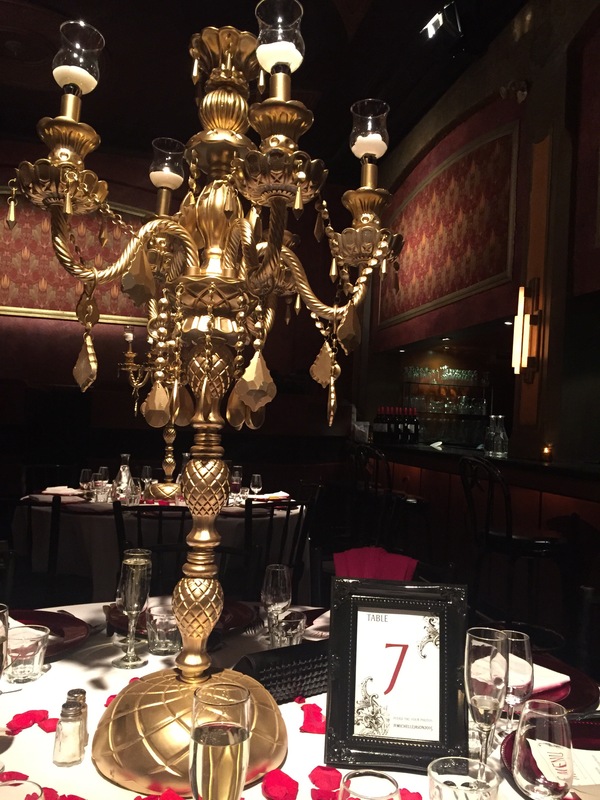 The monogram I designed had a filigree frame around an ampersand. 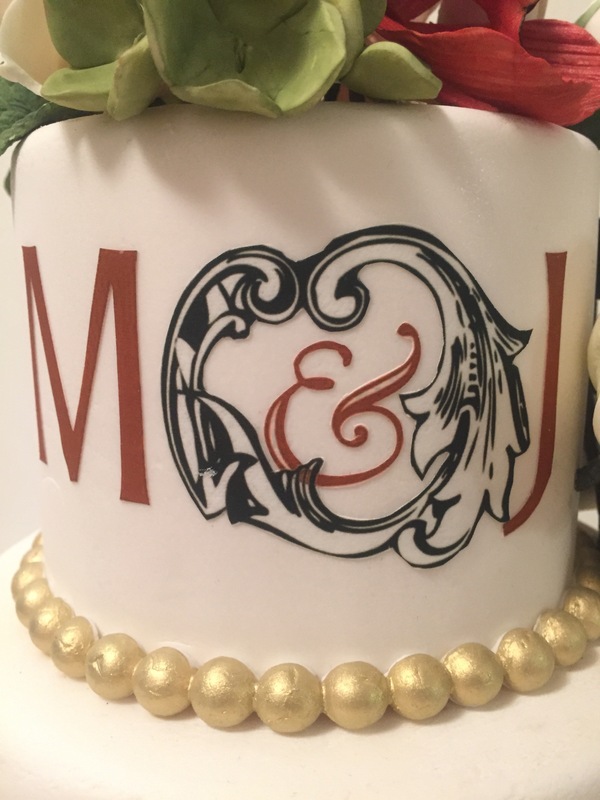 I printed an edible image of the monogram to use on the cake. This cake had two tiers made with dummies. These styrofoam tiers were created a few weeks ahead of time and they allowed me to make a more majestic looking cake. There were 98 guests to feed, with the vendors we were just over a hundred people. 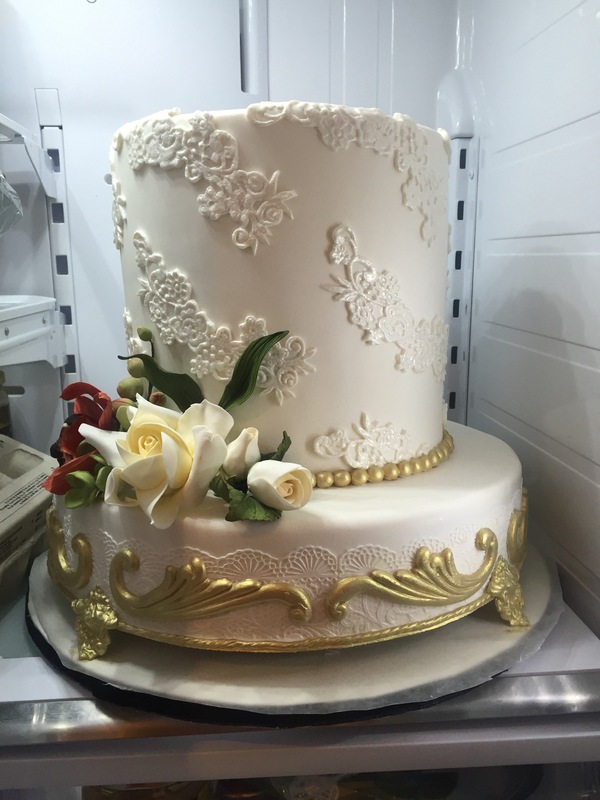 The very top tier was an anniversary tier, to be frozen and then eaten on May 23rd 2016. The two bottom tiers were also cake. One of them was a double-barrel tier, fancy wording for two tiers of identical size made to look like a single tier. 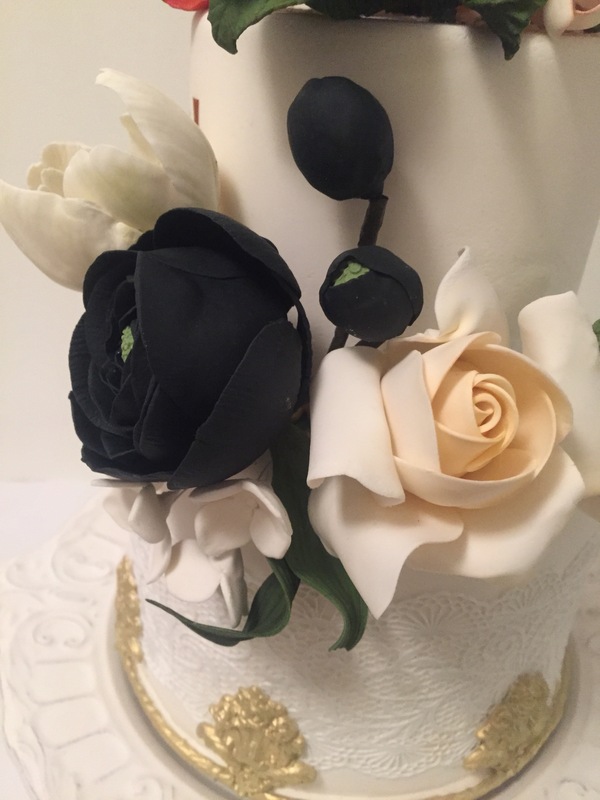 Covering these cakes with fondant has become my specialty. Not a single wrinkle, no elephant skin, very little tearing. Any imperfections were easily hidden with the lace applications. Speaking of lace decorations, I used a product called Flexi-Ice, a cake lace, from Squires Kitchen to make the thinnest lace possible. This bizarre product dehydrates for 50 minutes in a 100 degree oven then pulls out of the mould and remains pliable, like a thin fabric, for a few minutes. Just long enough to carefully manipulate it and place it on the cake. It was the first time I ever used such a product so it took some getting used to. 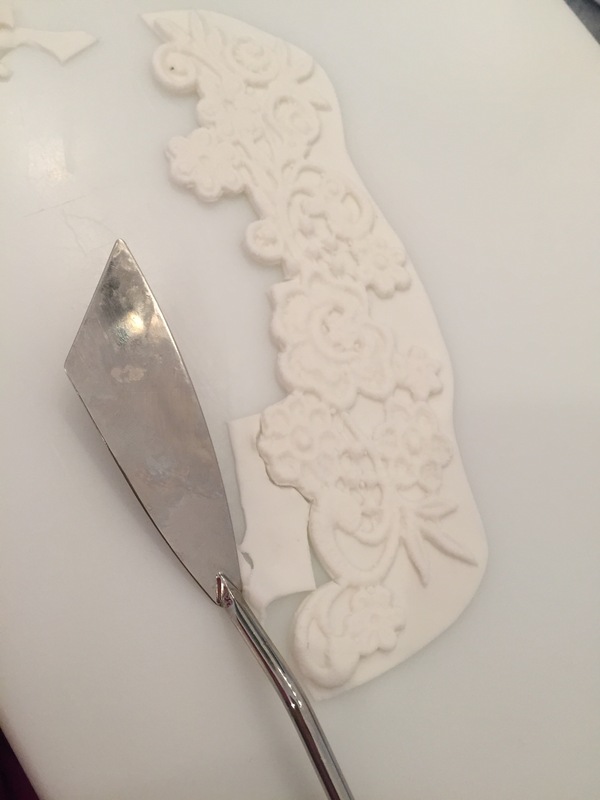 The most painstaking activity of all was carving out the lace appliqué. 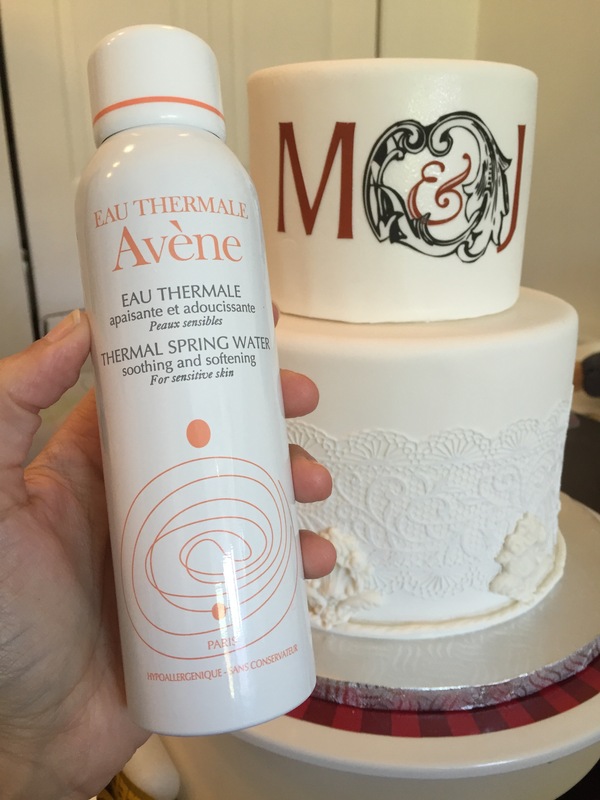 The quickest activity was spraying the cake with my Avène thermal water spray to adhere decorations to the styrofoam tiers. 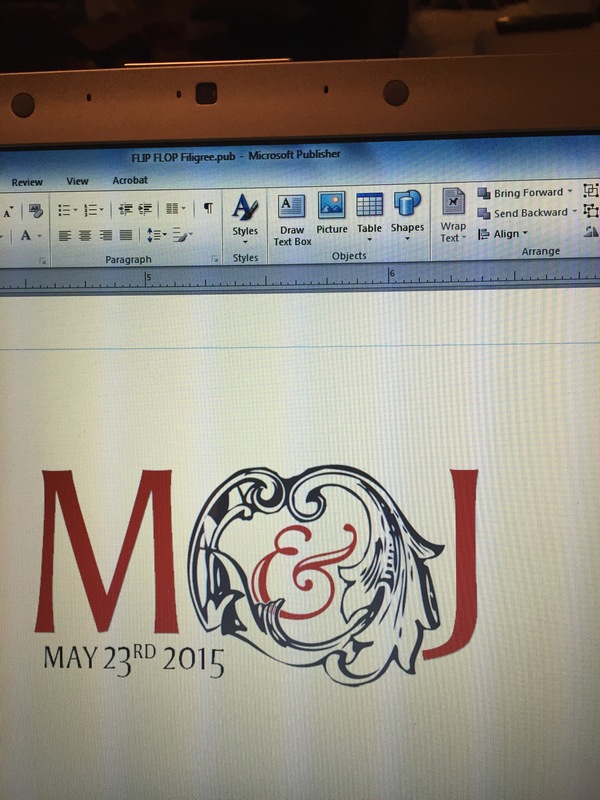 The monogram went on quite smoothly with this method. 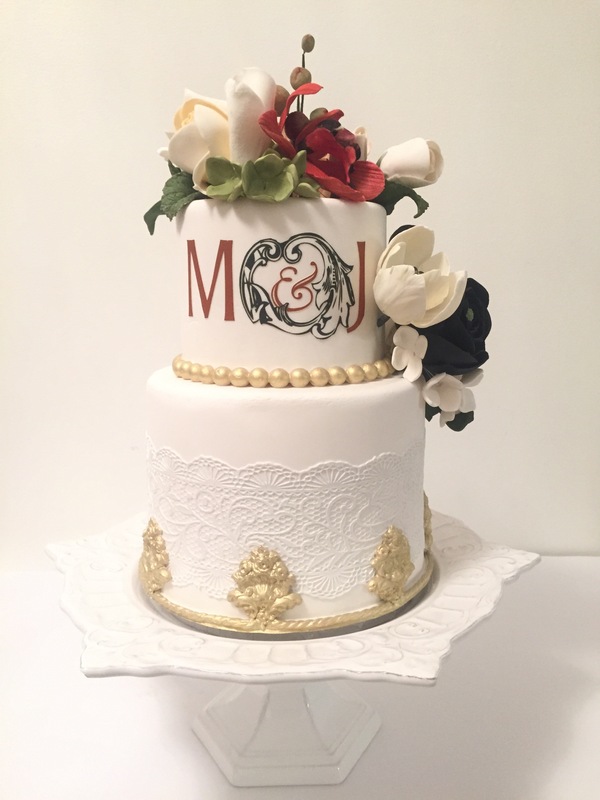 I hand painted all of the gold on the cake and tucked it into the fridge. I finished it at 2:30 am Friday night which is actually pretty good! Normally a cake this size gets finished just hours before delivery after staying up all night. 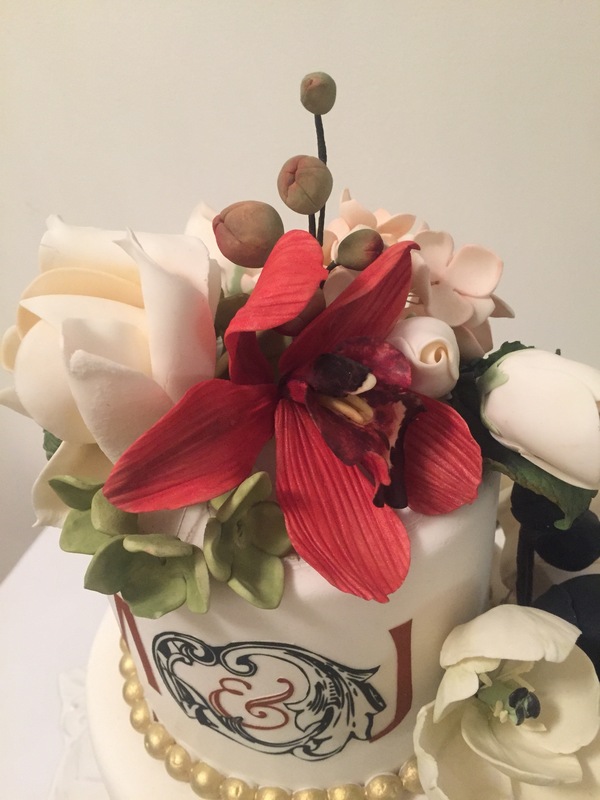 I decided to deliver the cake after the ceremony right before the cocktail hour would start. This was a poor decision, the heavy traffic made us over an hour late. The cake was delivered through a crowd of guests already partying. I literally had an audience around me watching me set up the cake. I had to repeatedly explain why I could just pick up the top three tiers of the cake by placing my hands on either side of the cake directly. Fake cake is feather light! All the decorations had ample time to dry and harden. Handling the tiers this way was just easier. The cake sat on a tall cocktail table covered in the most beautiful gold sequened table cloth I’d ever seen. 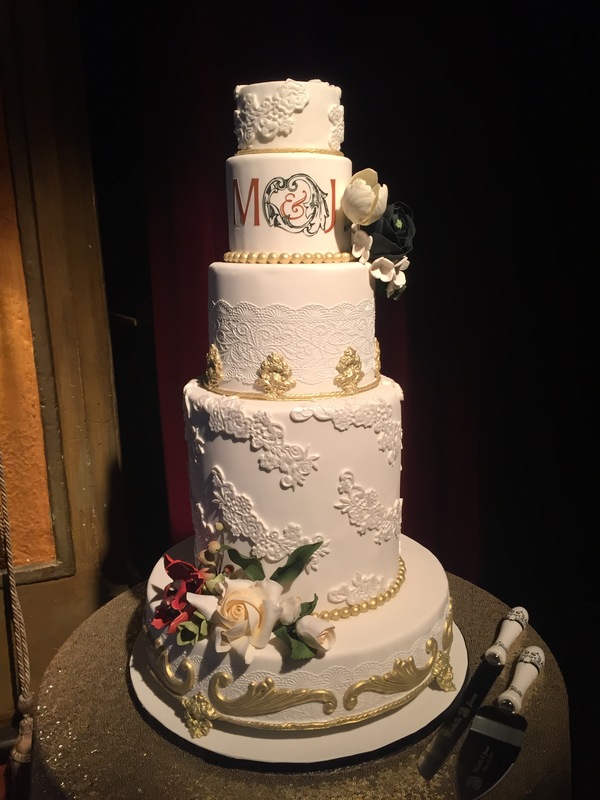 There was a spotlight directly on the cake. It was majestic. It fit the venue perfectly. I cut the cake myself, every single slice, which is quite a lot of fun. It’s an odd thing, to spend 100 hours decorating a cake and then in just twenty minutes, it is all gone. It messes with your head – I create things that only survive in photographs. Alas I do still have the fake tiers here at home. 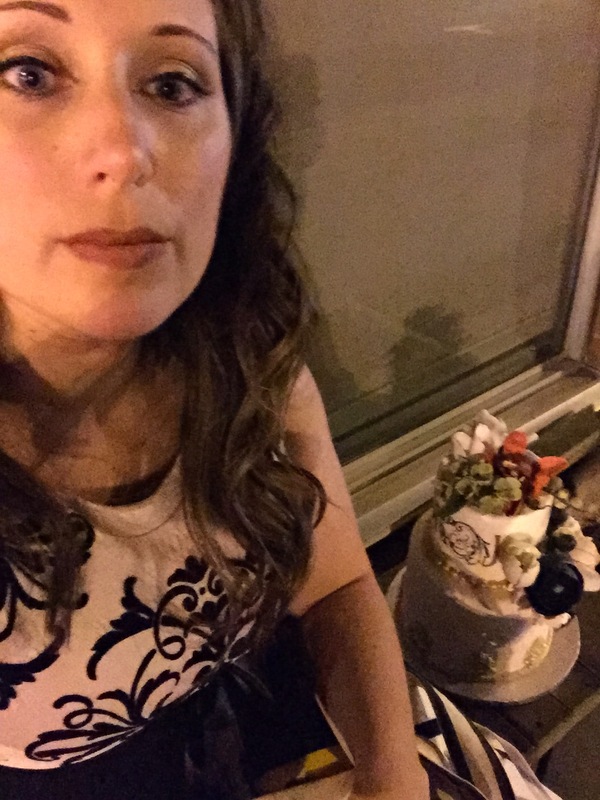 I brought them back with me, here I am at 1:30am sitting on a bench outside with the cake in front of the hall waiting for my husband to fetch the truck. And here it is, what remains of one of my favourite cakes I have ever made… Would Ron be proud of his student?